Enter a number that is greater than 1 that you want to perform a prime check on. Numbers greater than 1 million may cause the prime number checker to time out before it completes its calculations. 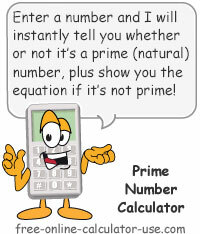 Prime?Is number prime?Is the entered number a prime number?Is the entered number a prime (natural) number? Is the entered number a prime (natural) number? This will be a yes or no result. Yes indicates the entered number is prime, and No indicates the entered number is not prime. If the answer is No the prime number checker will report the first divisor it found. This calculator will let you know whether or not a given number is a prime (natural) number -- with the click of a button. Plus if it turns out the entry is not a natural number, the calculator will report the first divisor it found, as well as show the equation and the quotient. If you would like to find all primes for a given composite, please visit the Prime Factorization Calculator. Or, if you wish to generate a customizable, printable list of primes, please visit the Primes List Generator. Enter the number you would like to check. Tap the "Prime Number Check" button. This will generate a "yes" or "no" answer, and if the number is not prime, the calculator will show the first divisor it found. Primes, or natural numbers are any numbers that are greater than 1 that are only divisible by 1 and the numbers themselves. For example, 13 is a natural number because nothing other than 1 and itself can be divided evenly into 13. The integer 14, on the other hand, is not a natural because it can be divided evenly by the factors 1, 2, 7, and 14 (see the Factoring Calculator to quickly find all factors of a number). The integer 14 and other non-primes are also referred to as composite numbers.